From the website of Christ Episcopal Church-Cordele: In his address to the Diocesan Convention of May 19, 1892, the Rt. Rev. Cleland Kinloch Nelson, then Bishop of Georgia, named Cordele as one of several towns which needed “to be attacked (to use the warlike phrase proper to a militant church) and to be strongly manned.” He pointed out that Cordele was a place where the church has, as yet, no foothold. ...detailed records of the beginnings of Christ Church were lost in 1944 when the priest’s residence burned. However it is known Bishop Nelson and Rev. Walker returned to Cordele in late 1896 and met at the Arthur Kirkland home with D. Ed Kennedy, C.C. Cutts and several others to finalize the organization of the Episcopal Church in Cordele…Christ Church, originally, was built on “Gunboat Hill” at the corner of South 9th St. and West 17th Ave. Shortly after the turn of the century, exact date unknown, the building was moved to the intersection of South 7th St. and East 14th Ave. At this time church school rooms were added to the rear of the structure. Moving the church the second time proved to be more difficult than anticipated and, according to newspaper accounts, the church sat almost in the middle of busy U.S. Highway 41 for a part of the time. Now known as “the most traveled church in the Diocese of Georgia” the original building was moved to its third and present location at South 1st Street and East 15th Avenue in 1952. 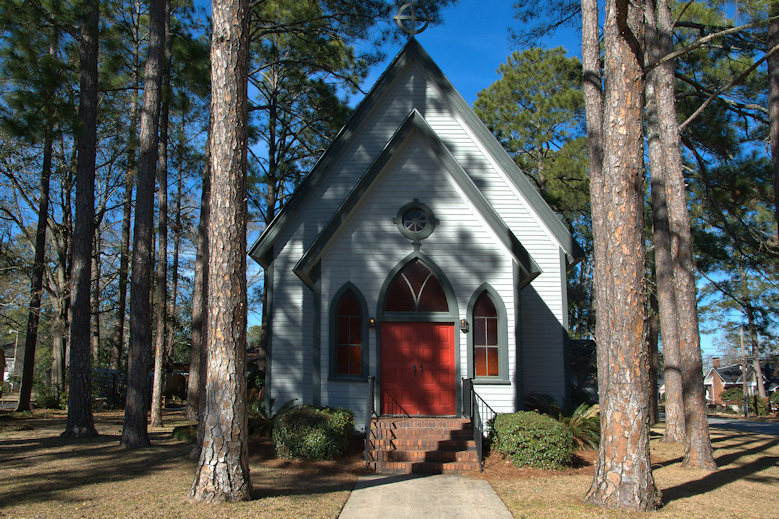 Christ Episcopal Church is typical of other Episcopal churches in Georgia built around the turn of the last century. I belonged to this congregation from 1998 to 2001, when I lived in Warwick.